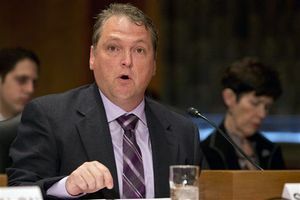 WASHINGTON (AP) â€” The Department of Veterans Affairs continues to retaliate against whistleblowers despite repeated pledges to stop punishing those who speak up, a group of employees said Tuesday. One called the department's office of inspector general a "joke." VA whistleblowers from across the country told a Senate committee that the department has failed to hold supervisors accountable more than a year after a scandal that broke over chronic delays for veterans seeking medical care and falsified records covering up the waits. Shea Wilkes, a mental health social worker at the Shreveport, Louisiana, VA hospital, said agency leaders are "more interested in perpetuating their own careers than caring for our veterans." Wilkes, who helped organize a group known as "VA Truth Tellers," said "years of cronyism and lack of accountability have allowed at least two generations of poor, incompetent leaders to plant themselves within the system," harming medical treatment for veterans. The informal watchdog group includes more than 40 whistleblowers from VA facilities in a dozen states.